With the New Year looming, many of us are deciding upon our New Years resolutions. For many readers of Everything Finance, those resolutions will have a heavy financial slant to them, and will often times include some type of savings goal. Maybe you want to fully fund an emergency fund. Maybe you’re saving for a much needed, pricey item. Or maybe the savings goals are more fun, such as a vacation, newer car, or a bigger home. Whether your savings goal is out of necessity or desire, it helps to have a plan in place. Here are four ideas on budgeting for savings goals this New Year. Some credit and debit cards have the options of rounding up your purchases and depositing the extra amount into a savings account. This is an easy way to ensure you are consistently setting aside money into your savings account. You can do the same thing yourself with a firm budget in place. All it takes is some consistent tracking of your spending against your budget. If you have set aside $75 a week for groceries, but you only use $65, put the extra $10 in your checking account. When I worked at NASA, I had to achieve certain certifications. Each certification earned me “cert pay” each month – all my cert pay added up to several hundred dollars each month. We never included that money in our budget, so that was all extra. Perhaps you have similar “extra income”, whether it’s from occasional overtime or that holiday bonus that seems to comes every year. Even if you’re certain you’ll get that extra money, plan your budget without it, and stash it all in savings. The same is true for income that you didn’t plan on receiving (some call this income a “windfall”). Perhaps you’ll get a tax refund for the first time in years, or you’ll inherit some money. You have a budget and your budget doesn’t need that money, so before you think too much about it, put it all toward your savings goal. If you are on salary and get paid every two weeks, you can set up your budget to assume that you’ll get two paychecks a month, which comes out to 24 paychecks a year. However, there are 52 weeks in a a year, so getting paid every two weeks means you get paid 26 times. Two months out of the year you’ll get an extra paycheck, which isn’t required in your budget. Put the entire amount in savings! If you use an all-cash system, as Dave Ramsey advocates, you are going to end up with lots of spare change jingling in your pockets. 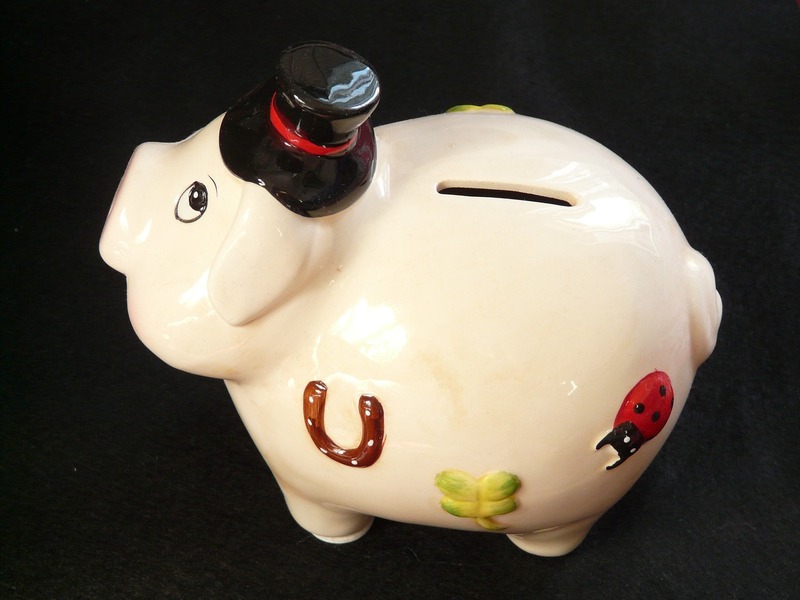 Crack out that piggy bank and fill it up – you’ll be surprised at how quickly the money adds up. Tip: ask your bank about their policy for large coin deposits. Some banks will allow you to bring in your coins and they’ll process them for you. Some will want you to roll the coins, but will provide the wrappers free of charge. Beware of the coin machines you see at some stores – they often charge fees. These methods are not exclusive – you can use one, or you can use all four! Depending on your savings goals and your motivation, you might choose to do the ones that are easiest, or your might challenge yourself to do them all. Your turn – what other budgeting tricks do you use to pad your savings account?